ເພື່ອ​ເຂົ້າ​ຄວບ​ຄຸມດິນ​ແດນ ທີ່​ຕົນ​ໄດ້​ສູນ​ເສຍ​ໄປ ຢູ່ໃນສົງ​ຄາມ ​ເມື່ອ 7 ປີ​ກ່ອນນັ້ນ ​ຄືນ. ທູດພິເສດ ສປຊ ຮັບຜິດຊອບ ເລື້ອງຊີເຣຍ ທ່ານສເຕັບຟານ ເດີ ມິສຕູຣາ. The United States says it is close to defeating Islamic State in Iraq and Syria, but officials have no plans to withdraw U.S. troopsin either country in the near future. A military spokesman said Tuesday the U.S. mission is to maintain peace in some of the areas that have been ravaged by terrorism and conflict. The announcement comes after Russia and Turkey agreed to create a buffer zone between the government forces and rebels in Syria's Idlib province.VOA's Zlatica Hoke has more. Idlib is the last remaining bastion of Syria's opposition following the government's military campaign, supported by Russia, to regain control of the territories it had lost in the seven-year war. Assaults on Aleppo and other rebel-held areas have exacerbated Syria's humanitarian crisis and Idlib threatened to be an even worse disaster. 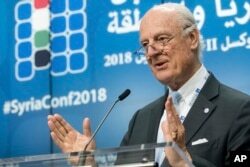 The United Nation's special envoy for Syria welcomed the agreement reached between Russia and Turkey as guarantors of peace. "And now that we have this deal, there is no reason not to move forward expeditiously with the political process." Russia's U.N. envoy, however, did not sound receptive. "I wish to tell Staffan it is not worth perhaps using the Security Council to exert pressure on the guarantors. They are doing more for the political process than anybody present in this chamber. It is important for you to facilitate, not to lead the process." The U.S. envoy questioned whether Russia is interested at all in a peaceful solution for Syria. "If Russia is interested in bringing peace to Syria, it should make sure Iran and its militias leave Syria once and for all. The risk of a broader conflict will leave with them." And the question on almost everyone's mind is how long the current agreement will hold. "Is this merely a stay of execution? Or is it the beginning of a reprieve, the first tiny glint of light at the end of the very darkest tunnel?" The United States has about 2,000 troops in the Manbij area in northeastern Syria. A military spokesman said the United States has three roles there. "Destroy ISIS (Islamic State), train local troops so they can take over, and then hopefully the Geneva process will take over. I know that they (parties in the conflict) had a meeting in Geneva on September 14. I've not seen details from that but that's the basis we are going on right now." "We have done a tremndous job in Syria and in that region in eradicating ISIS and we are very close to being finished with that job and then we are gong to make a determination as to what we are gong to do." Meanwhile, a solution that would end Syria's seven-year-long war remains elusive.